Milwaukee offer two reciprocating saws which include M18ONESX-0 and M18CSX-0. The Milwaukee M18ONESX-0 fuel sawzall delivers 135 Nm of peak torque and up to 2,000 RPM. The sawzall is ideal to use in tight work spaces and is only 7.60” in length which helps the user use the sawzall for longer periods of time. The Milwaukee M18CSX-0 reciprocating saws motor gives the user around x5 longer motor life and up to 30% faster cutting. The saw is equipped with a gear protecting clutch that extends the motors life and gear due to it absorbing high impact forces that can be caused when the blade suddenly locks-up. The saw also enables the user to change their blade easily, safely and quickly with the FIXTEC blade clamp. Also available are Milwaukee hackzalls which gives the user 22mm and 13mm stroke length for controlled cutting with a no load stroke rate of 3000 spm. The blades can easily be changed due to the Milwaukee® patented FIXTEC clamp which enables you to change your blade without the need for using a tool. The hackzalls are available in 12v and 18v. If you are looking for a reliable reciprocating saw, or Sawzall, then you need look no further than Milwaukee. Milwaukee reciprocating saws make cutting through a variety of materials much easier and faster than a regular saw, enabling you to complete a number of projects in record time, regardless of whether you are a tradesman or simply doing a bit of DIY round the house. You know that you are getting quality when you buy a Milwaukee Sawzall. It is a tool that won’t let you down. There are two Milwaukee reciprocating saws to choose from: the M18ONESX-0 Milwaukee fuel Sawzall and the M18CSX-0 Milwaukee 18v Sawzall. The M18ONESX-0 Milwaukee fuel Sawzall is shorter in length and ideal for working in tight spaces, but still delivers plenty of power with 135 Nm of peak torque and up to 2,000 RPM. The M18CSX-0, meanwhile, provides 5x longer motor life with 30% faster cutting, making it well-suited for heavy duty usage. Additionally, the Milwaukee Sawzall has a gear protecting clutch which extends the life of the motor and the FIXTEC blade clamp makes changing the blade on Milwaukee reciprocating saws quick, safe and easy. You can purchase a Milwaukee 18v Sawzall from SGS on its own or as a bundle with a battery and charger. 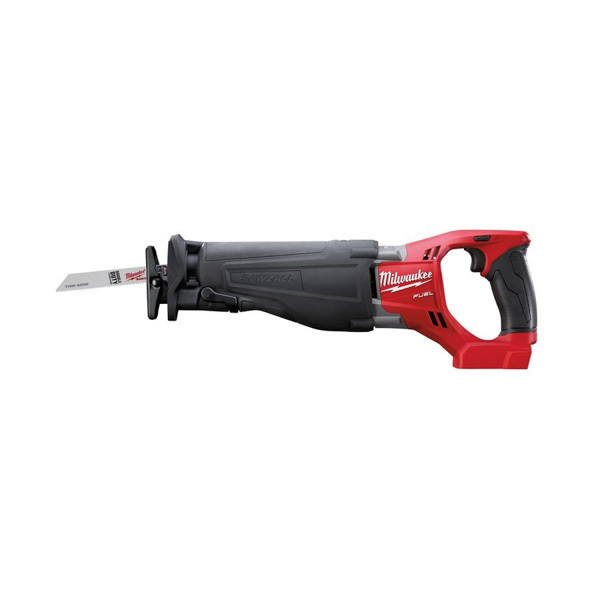 Milwaukee cordless reciprocating saws increase productivity and take all the labour out of sawing, so buy yours now and benefit from effortless sawing.